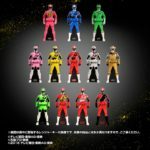 Gokaiger Ranger Key Set 2000th Edition Fully Revealed! You may be wondering about a couple of these. The Kyoryu Pink & ToQ 4 keys included are stated to be repacks from the previous Premium sets they were a part of. Obviously to coincide with their use by the Gokaigers in the Zyuohger team up. Aoninger is prominently pictured with those two as well, but is a no brainer as a part of this set. the curious exclusion is a Yellow Buster Key. If repacks were on the table, why not included that one? In either case the Gokaiger Ranger Key Set 200th Edition will be sold as usual as a Premium Bandai Exclusive. Orders open tomorrow, 9/12/16, with a release date for this set in February 2017. Retail price for this key set is 16,200 yen. Be sure to vist your preferred middleman or service today to secure an order! Premium Bandai’s in house Super Sentai Artisan line continues with a new dual release! Today we get to take a look at the recently released Artisan Rodeomaru & Chouzetsu Akaninger 2-pack! Rodeomaru & Akaninger are of course both new high end replacements for their DX counterparts. Rodeomaru offers a splendid new accurate robot mode with a healthy amount of die-cast metal or “gokin” parts thrown in for good measure. He also includes some replacement arms and shoulders to help recreate his combination with DX Bison King. 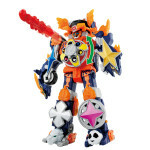 And much like the previously released Artisan Shinobimaru he also included a to-scale Starninger figure! 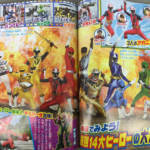 Chouzetsu Akaninger on the other hand is a tiny yet articulated alternative to the figure included with DX Lion Ha Oh. While there are no metal parts present in this mini-figure, he does manage to include his Ninja Ichibantou as well as 2 adapter pieces to allow him to function with Lion Ha Oh. We’ve attached a selection of images to this post, but feel free to click “Discuss on the TokuNation Forums” to view the full 50 image gallery! Shuriken Sentai Ninninger Upgrade Revealed- Super StarNinger! A new level of Nintality is approaching! 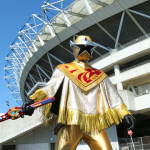 During the next episode of Shuriken Sentai Ninninger, Kinji (aka StarNinger) will obtain a new form- Super StarNinger! This gives the Cowboy Ranger a brilliant new golden poncho. In addition, Kinji will be receiving a new weapon called the Ninja Gekiatsuto– which is a recolor of the Shinobi Ichibangatana used by the five main Ninningers. 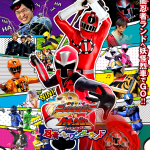 Super StarNinger will be unleashed on November 8, 2015! 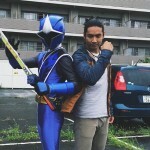 Yoshi Sudarso to Cameo in Ninninger Next Week! File this one under totally unexpected and totally awesome! Word has just dropped on Yoshi Sudarso’s facebook page, and been officially confirmed on the Toei Ninninger site, that Yoshi will be making a brief cameo in next week’s episode of Shuriken Sentai Ninninger! In Yoshi’s words this will only be a “quick cameo”, but this is pretty exciting and very unusual. This actually marks the first time ever that a Power Ranger actor (from the excellent Dino Charge no less!) 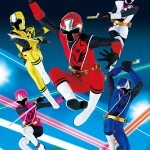 will make an appearance in an episode of a Sentai! This episode also marks the return of Metal Hero Jiraiya! So this is going to be one very exciting extra special episode of the series. Whether you’ve continued following Ninninger or not we think it’s safe to say that this is one episode that people across the world will be tuning in to! We’ll see you next week Yoshi! The official Bandai B-Boys website has jut updated with it’s October offerings, and that means it’s time for a brand new official image dump! First up on the list is the DX Gekiatsu Dai-Oh from Shuriken Sentai Ninninger! DX Gekiatsu Dai-Oh is a brand new 6-piece mecha formed by all 6 Ninningers. The epitome of Takaharu getting “fired up” this set offers a new uniform color scheme not typically present in combiners of this nature, and is unified by flame detailing. DX Gekiatsu Dai-Oh will be released on October 10th! 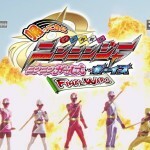 A special new video game featuring the adventures of Shuriken Sentai Ninninger has been released on the Nintendo 3DS EShop! The game appears to be a basic sidescroller with various combat styles for each Ninninger. The Ninningers’ 3DS adventures will cost a mere 926 Yen!